This woolly sheep is hiding behind a bush. Will the shepherd be able to find it to take it back to the other 99? 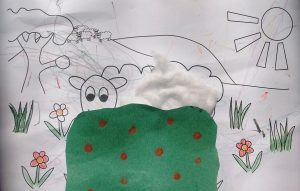 The children should colour the picture and stick cotton wool to the sheep’s body. They can then glue one edge of the bush onto the picture so the sheep can hide behind the flap.